Moving out of the realm of potentiality and into the world of form we soon become an admixture of the very many impressions that impact upon us. Yet the very first condition is that of purity, we are what we are in essence and in innocence, nothing more than the distillation-seed of what has gone before. 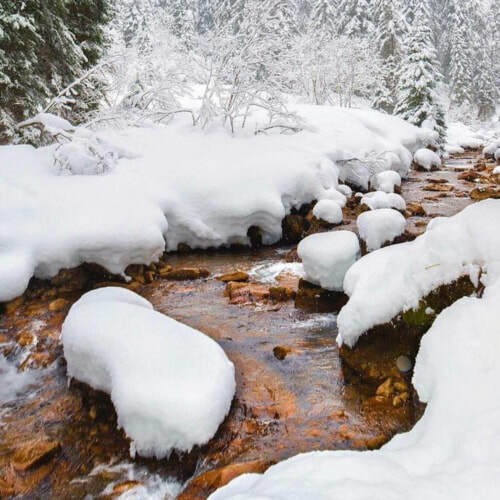 A clear mountain stream is spirited, pure and free. In essence, so are we. The essence of who we are is life force, it is pure spirit, consciousness itself. Resourcefulness is indicated because it arises out of these essential qualities. Like a stream racing onward, we dash headlong into a mysterious future with no reassurances except the sense that spirit always finds a way. Spirit cannot know fear or doubt, its time frame is immediate so there is not a single moment between thought and action; not one moment’s consideration is given to whether a thought or feeling is apt or risky. It is only when we forego spontaneity that the concept of risk arises. One of the risks we feel that we take is that by acting spontaneously in trusting in our naive feelings of desire we will forego better opportunities. Such doubt diminishes will and undermines the trust we place in ourselves. However, we may indeed certainly trust in the irrepressibility of pure spirit. We will always feel the urge to move on – and, deep down, always feel strength in the certainty that as long as we are true, we are eternally safe, and will eventually find our optimal path. The only activity that can significantly restrict our freedom is a self-selected intention, whether conscious or not. Our goals are the means by which we focus the mind, and pull together all the variables of a situation towards a given end. Very few people have learned how to focus on one thing at a time. To focus on more than one thing is to lose focus – it is not focus. High achievement is realized through an unswerving fidelity to some definite course of action. The stream’s single purpose is to unite with the ocean. Spontaneous action does not always lead to expected or even desired outcomes in the short term; emergencies can arise. These are to be interpreted as issues of urgent feedback, which call up previously unused potential in order to awaken new skills and so augment our toolbox of talents, furthering the depth and reach of our potential experience. It is by trusting in the contents of this toolbox that we are freed of the constraints laid down by our circumstances. Patterned behaviour is for those who choose blind obedience for its predictable safety. Freedom is for those who depend on the power of their resourcefulness.